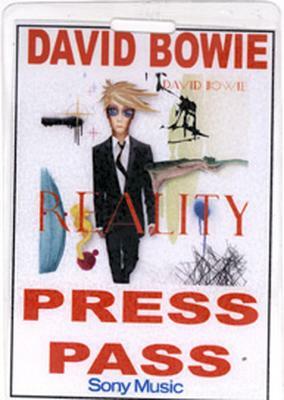 Following the concert in Wellington, Bowie and his band left New Zealand for Australia - the place where a further 7 Reality concerts were proposed in addition to a radio interview and two major television interviews. 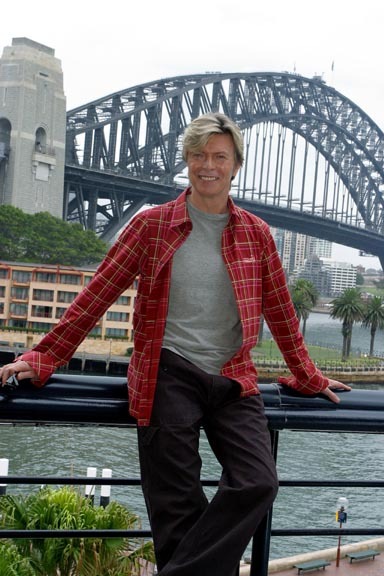 Using Sydney as his main base for the next few days, Bowie's arrival was marked by a press conference held at the Quay Restaurant just above the Overseas Passenger Terminal at Circular Quay. 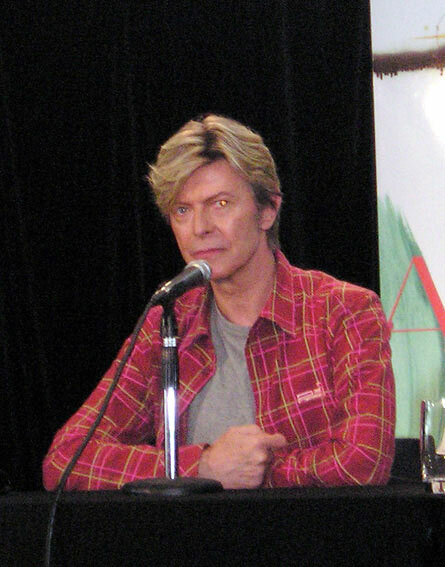 That evening (on the eve of the first Australian Bowie concert in 17 years), various snippets of the conference were aired across several news programs. 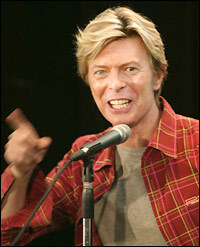 "I don't think people have realised how many children I have fathered," Bowie joked. "Whenever a gig comes up, I see all these kids mouthing 'dad' at me." 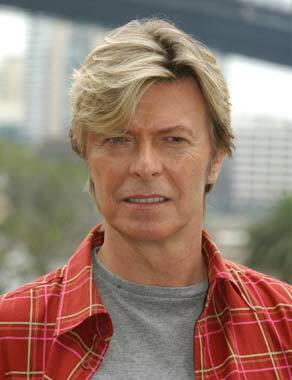 Bowie reminisced about his old apartment at Elizabeth Bay but said he wouldn't have time to visit the old haunts, including The Evening Star Hotel where he spent a few nights while recording his Tin Machine album in Sydney. 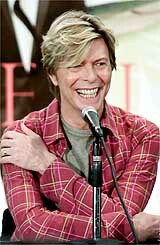 "I think we'll only have time for one quick spin around the Harbour," Bowie said of this visit. 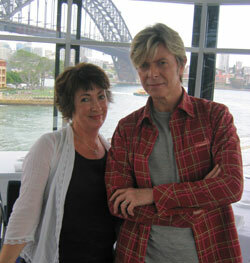 Directly after the conference, Bowie was interviewed by ABC Radio 702 Breakfast host Angela Catterns. 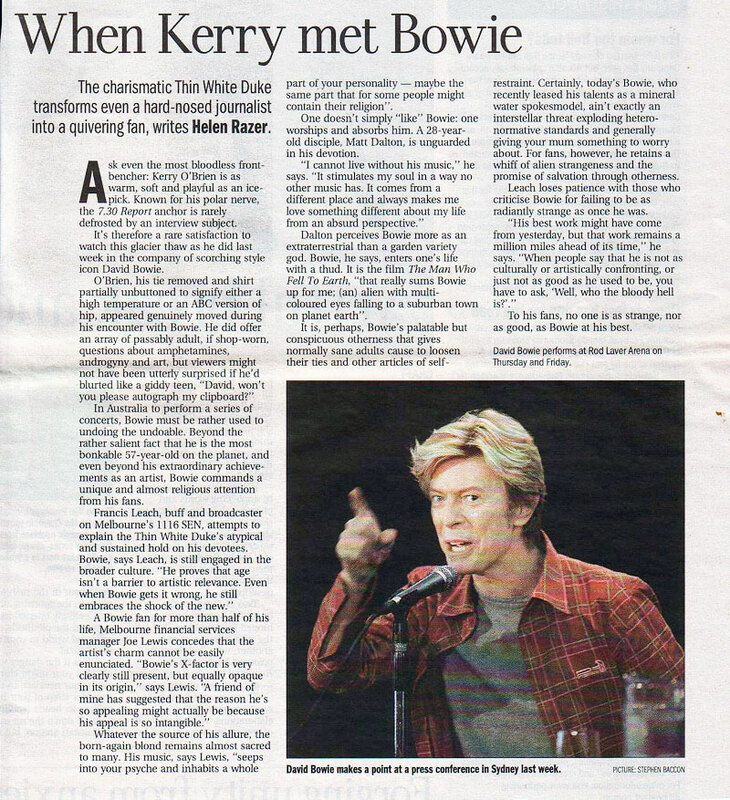 Later that day, Bowie was interviewed for ABC televisions The 7:30 Report. Transcripts as follows. 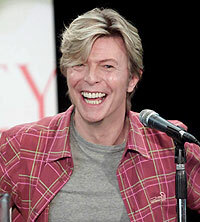 David Bowie, welcome to ABC radio. Thank you very much. It's good to be here. It's been a while hasn't it? I am wondering if Australia feels the same or you are noticing changes since you have been here last 16 years ago? I've only been here a few hours. I mean, this has become quite a complex where we are right now on the Quay. And it's a shock seeing the Queen Elizabeth because the last time I saw that, I was on it - which was only last year but they pulled it out of service because of the new one. Did you go for a trip on it? Yeah, I;ve taken it several times over the years. Very early in the 70s, I used to go backwards and forwards on that to America and just out of old time sake, I did it last year as well. You must have been a young pup on board compared to some of the others. Yeah, it was mainly old widows (laughs) looking for.....I don't know what they were looking for. I hope they found it. I know they employ dancers. They hire men to dance with the old widows on board on that ship. Oh dear. I never knew that. David, you obviously have quite a fan base here. I remember it was last year that your fans actually payed to go to the Reality album launch. Do you remember that? They payed to go sit in the cinema and you were obviously hooked up by satellite. Oh yeah, yeah. That was a real experiment to see if you could do those kind of live shows to cinemas. I think the process is so expensive I think it's a bit prohibitive at the moment. But once they work out how to reduce the price of the actual equipment to be able to show that, I think it could become fairly popular. You obviously like to service your fans. Is that true? Some of them (laughs). Thank you very much. Yeah, some of them are quite nice. I think you know what I mean (laughs). So David. I am not sure if you've already discussed this but you made some great clips here.....here in Sydney. Yeah. You know I told the folks upstairs here earlier that I actually used to have a place here on Elizabeth Bay that I do regret selling now.....because it's escalated in price beyond belief. I couldn't believe when I heard what it's worth now. It's just a little flat you know. A little apartment. Overlooking the bay, overlooking the marina. Really gorgeous. But I was just not coming here enough unfortunately. But when I was here, it was great to be able to make video. I mean it was so easy to get the work done. Everyone worked so hard. There are such visual treats here that are easy to pull into a story. I enjoyed it very much. I wonder if it's ever bothered you that a video is as important as a song in the music industry? Not to me really because I haven't had videos played on television in years. Or songs played on radio. I mean for artists of a certain age, you have to rely on other ways of getting your work known. So videos and radio play are two areas I have no knowledge of whatsoever. Most of what I do is about word of mouth and people enjoying coming to the shows and then going out and buying the album that they've heard these new songs from. Or people have been recommending my albums to them. So that's how it works with me and it's been very successful. I know a lot of artists of my age. I won't mention any names. But they've just literally been driven out of business. They can't work anymore and they've given up. They've gone broke because they can no longer get things played on radio. So it's kind of unfair. It's a really ageist thing in this business and it's been hard for a lot of people. People like myself and Dylan and Neil Young have been very lucky. Very lucky. Because none of us get played on radio. You're working again with Tony Visconti who you first worked with in 1969-70. Is that right? Oh yeah, in fact we go back to 67. That was the first work we did together. So it must be fun having come full circle at this point? Yes it really is. I mean we've got such a long history both with and without each other. We've both had great separate lives. Tony has had lots of success on the road once we weren't working together between the middle 80s and now. And we've got so many shared experiences about how rough it was at the beginning and all those usual stories of trying to create a career for oneself. Well you're both long term survivors in an industry that really gobbles up and devours people. So why is that? Is it fate or something you did right? No. I think it's because we both are very talented (laughs). Ah, yes and modest with it. I'll tell you what, that's not the entire story because I do know a lot of talented people who have not been able to cut through. I don't know - we've had an awful lot of luck on our side too because having a talent is not the be all and end all in this particular profession. There are so many things to take into consideration. And I think both of us were just very, very lucky that our work was able to come through. That helps (laughs) .....That helps when you are trying to promote new albums. Although, actually. It often helps to be dead. The album would seem to do a lot better if I chuck myself of say that big ship just outside this window. I think we'd see Reality go right throw the charts. That's true. And wouldn't this interview do well too? Oh yes. Absolutely. (laughs) Definitely. David, I read that at your shows these days you get punters that have latched on to you at different times of your career and different stages so there is a really diverse bunch of people out there that you're looking at. That's absolutely true. It's like a wardrobe display out there (laughs). I want that hat and those trousers. It can be extraordinary. Some cities are more into that than others. Let's see the last one that was really good in.....LA - that's where we were. The last one shows in LA and Las Vegas were insane. They were like dress up contests. It was rather wonderful. Yeah, and then you've got the guys who are just dressed in a t-shirt and trousers and you think they must either be really into the new stuff or they know nothing about me at all (laughs). That's really fantastic. I must say I got really tired of reading your biog and the numbers of albums and movies and clips and books and things that you've done. Are you ever just bone idle? No. I really enjoy the work that I do......and I don't see me doing anything else. And it's a parallel importance along with my family. And I don't think I have to do anything to sustain it. I mean, if I just lived as a family guy with my wife and child at home, there would still be something that would make me write. You know, I couldn't give up writing. Would you paint. Do you still paint? I haven't painted in two or three years now and I think it's because music has almost eclipsed everything else. But I surely would get back into painting and sculpting. I like it. Are you driven by experimental zeal? I am not driven very much at all really. It comes as second nature to me to work. I am not driven to write but I just can't stop writing. I can't go near a piano or a guitar. And if I play it for a few minutes, it's only a few minutes before I start writing something. There's no break on it you know. Well, that's a gift. You mentioned having a family are you loving having a small daughter these days? It's wonderful. It's precious and terribly scary. You've got a son who's over 30, yeah? Yeah, he's over 30 and also scary (laughs). He doesn't have kids. You're not a grandfather yet? No. He's been very serious about his chosen profession which is film making but on the other side as director. And I think he's throwing all his energies into that. Obviously he and his girlfriend will be marrying sooner or later but they are both very career minded. Do you miss your daughter while you're on holid....err not holidays - on tour I imagine? I wish we were all on holiday. I mean of course I do. There is nothing worse than that nightly phone call that says 'Daddy, why aren't you here?' 'I'm working'. 'You're working too long'. You know, it breaks your heart. You know, I think at her age it's hard to conceive that you're not actually at home. I mean 'Are you on the elevator? Are you on the stairs?'. Are you down the road? Yeah, it's really a tough call. I know we've got to wrap this up. David, I read a lovely comment on the net last night. A reviewer said he could see the twinkle in your eyes from 40 rows back. (laughs) I am so jealous of his eye sight! (laughs) Is it still a genuine pleasure for you to perform? Every single night. You don't go on stage until we are full of the desire to have as good a time as we possibly can and if we go on with that attitude our presumption is that the audience will also have the same night that we are going to have.....despite them. So you sort of gee yourself up before hand? Yeah, it's very much our show. And we do it to for our enjoyment and if we can do that then I can guarantee the audience will enjoy it too. Beautiful. It's a delight to meet you. Thank you for your time. Other rock stars have endured for as long as David Bowie, but few have had the same impact and none have re-invented themselves as often or as successfully. He was the androgynous king of glam rock who launched Ziggy Stardust on the music world in the early 70s, who donned a frock for another album cover, declared himself bisexual and lived the part. But along with the dramatic and, by mainstream standards, bizarre images of that decade he produced a stream of ground-breaking music that critics say had a profound impact on what followed. 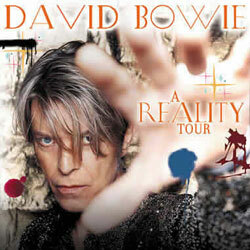 Now a somewhat more sedate 57, in a stable marriage with a three-year-old daughter, Bowie no longer hits the top of the charts, but he's still a prolific songwriter, pulling sell out crowds in concert. He's about to start his latest Australian tour and I spoke with him in Sydney earlier today. I take no responsibility at all, Kerry. ...as there has been about the reinvention in your music. I wanted to write theatrical - actually, strangely enough, well, maybe it's not so strange when you look at it in context, but when I was around 17 or 18 what I wanted to do more than anything else was to write something for Broadway. I wanted to write a musical. I had no idea of how you did it or how musicals were constructed, but the idea of writing something that was rock-based for Broadway really intrigued me. I thought that would be a wonderful thing to do. I saw myself as someone who would end up writing musicals in a way - probably rock musicals of some nature - but it never actually became that. So, in a way, those ideas were kind of quashed a little when I realised what a huge ambitious thing that was to take on, you know, because you have to write dialogue and all that. And I really didn't know how to approach that so I took a far simpler course and kind of abbreviated the idea of musical to a concept piece for an album, and created the characters to go with the albums. Well, Ziggy Stardust is a classic illustration. How much of Davey Jones is in Ziggy? I don't think there was very much at all. I honestly was trying to create an idea of how to expand rock and expand the horizons of it and I took as the alien form for Ziggy, as he was supposed to be an alien of some kind. I based him very much on the Japanese concept. At that time, in the early 70s, we knew so little about Japan and Japan really hadn't exploited itself and brought its stuff over to the West, so it still liked an alien society. But it was a human alien society, so you could make a human connection to Japan far more than you could say Mars, which would be beyond. And what was behind the androgynous images of the 70s? It seemed so perfect within the time, that that really represented what the 70s was all about. There was such a feeling coming out of the 50s and into the 60s and there was a opening of attitudes in the 60s. And then there was the 70s. It was the pluralistic 70s, you know. There were so many sides to a story in the 70s. Before, in the 50s, it was black and white. It was one story yes and one story no. But in the 70s you could look at so many different things in different ways. The idea of absolute was starting to disappear. It wasn't the right way and the wrong way. And I just felt that it really summed up what the whole of the 70s were going to be about. It was a guess and it was a good one. But how much of that was you? Oh, I think that definitely was me. I was in my opinions, and in my interests I was extremely Catholic. There is nothing that didn't interest me. I had a burning career. I still do have a burning curiosity about just about everything, except country and western, of course. But other than that, I really like to understand the society that I'm living in and how it works and functions and what people are thinking, you know. You can't be a writer in any other way, I think. You have to sort of know where you are to write. Is that how you see yourself mostly or primarily as a writer? I think until up the last couple of years I would definitely have said yes, absolutely, completely. I never enjoyed performance very much. And that was a shyness? I never felt like a natural performer, you know. I wasn't an outrageous person at heart. I was actually a very quiet little Capricorn boy at heart, you know, and it seemed that I could get a kick-start to having to perform by, you know, working within the within the functions of characterisation. The last two three or years I have just thoroughly enjoyed singing the songs that I wrote for all those people (laughs) myself and just interpreting them myself. And I have such a wonderful supportive band that I have had now for eight years. So now I am a writer and also a performer. You actually wrote, recorded the song Fame. Lennon worked on that with you. Oh, hell, I mean, he was one of the major influences on my musical life. I mean, I just thought he was the very best of what could be done with rock and roll, and also ideas. I mean, I felt such kin to him in as much as that he would rifle the avante guard and would look for ideas that were so on the outside, on the periphery of what was the mainstream and then apply them in a functional manner to something that was considered populist and make it work. He would take the most odd idea and make it work for the masses. And I thought that was just so admirable. I mean, that was like making artwork for the people and not sort of having it as an elitist thing. It was so much about him that I admired. He was tremendous, you know. Living in Los Angeles in the 70s has often been described as a lost or depressed period for you, if not dominated by cocaine then certainly deeply affected by it. What are your own standout memories of that time? I have no standout memories of Los Angeles! Well, what's your perspective, looking back? I guess a lot of it had to be my trying to function behind what really was an extremely shy reclusive kind of personality that I had. I probably, like most people who get deeply involved in drugs, I felt it probably helped me break out of my inhibitions. It just throws you into a real quagmire of psychic and emotional hell, really. It just brings out, or creates, awful traumas for you. But I had no idea of that, obviously. What would you say it cost you in personal terms? Oh, it cost me a lot of years where I could have spent them in a very different way and had a healthier and more fulfilling kind of - I mean, I think the work that I did during that period was surprisingly really good, you know. But what you don't know is what you might have been doing without them? Yes, the thing is so many people find it fashionable to say you couldn't write those things if you weren't on drugs and all that. I just doubt that's the truth at all because some of the best things I wrote in that period I had already cleaned up. It was an awful, dreadful period for me. The only escape for me in the end was just to get up and clean myself out, you know, and just finish my association with cocaine, which had become such a problem that I couldn't function in any other way from day to day. I mean, you've seen photographs of me in that period. I was weighed 95 pounds or something. I am absolutely amazed that I actually survived that period. The David Bowie of today is pretty straight in every way, I read recently. That your content with reality, that you're no longer the trail blazer. I hope I am somebody that other artists could look to as maybe someone who has learnt how to ride the full curve of having some kind of longevity in their chosen profession, you know. I'm still writing and producing the music that I've always wanted to. And I still have a very loyal audience. I don't think live life could be better for me. I think I am a good example. How much of Davey Jones is left in the David Bowie of 2004? I think there's an awful lot of David Jones there, yeah. I think you finally become the man you always should have been. And I think now that I'm probably truer to my real nature than I ever have been in my life, except maybe for when I was eight or nine when I first heard little Richard. And you're pretty comfortable with that? Yeah, I'm very comfortable with that. 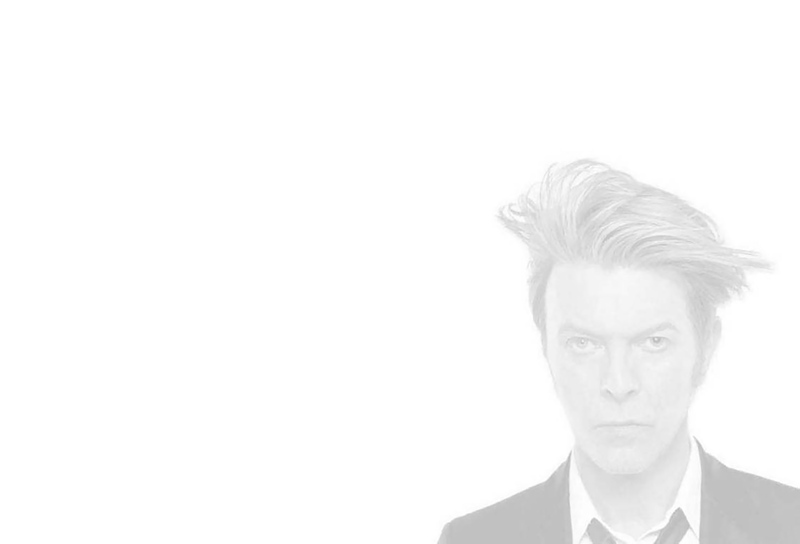 David Bowie, thanks for talking with us. 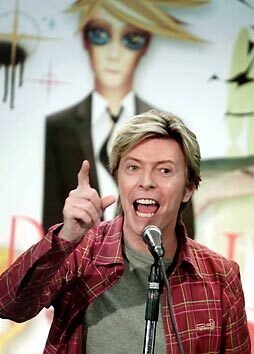 Davey Jones, the kid from suburban London who became David Bowie, rock legend.